If you own a nano aquarium, you will always need a protein skimmer when it comes to cleaning your aquarium. So, what is the best nano protein skimmer? Most people would have that question in their minds thinking of the best way to make sure that their aquariums stay clean all the time. 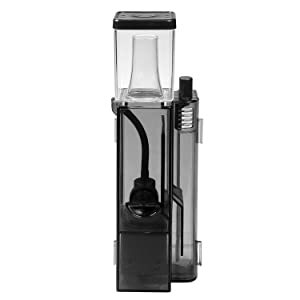 Most manufacturers understand what people need in a nano aquarium protein skimmer. With many models available, you might be confused about which model to choose, but that should not worry you. We have shared some of the top models you can choose today for your aquarium. 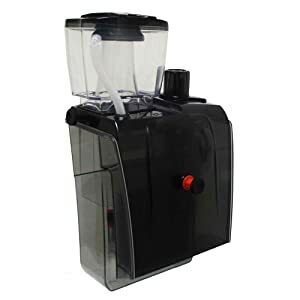 Check out the following models to make an informed decision about the best nano protein skimmers. What is the Best Nano Protein Skimmer? How to Set Up a Nano Protein Skimmer? This model opens you up to a different type of skimmer that you have seen on the market before. The model has its components designed for internal operation. With such design, you get a model that is highly sophisticated and also ultra functional. This type of model will end up cleaning your aquarium water and still taking up less space. The goal is that you get to use less space and still get more performance from a skimmer. The model can be used for seawater aquariums or the soft coral aquariums without any problems. The water supply is great to ensure that the water remains at the right level in your aquarium. The presence of the suction feature is great so that it can remove the bacterial film on top of the water surface. The skimmer will also provide you with efficient foam production. It is important that you get the right amount of foam. Having too much of the foam makes it hard sometimes for the process to be effective. If you are looking for a quality skimmer, there is a chance you will end up with this one. Many people who have used it agree that it has helped them enjoy the value of their money with its construction and performance. The small footprint is further important for someone looking for a great skimmer for a nano protein skimmer. The model has a compact size so that you can have an easy time adding it to your aquarium setup with ease. The installation part is what gets most people liking it even more. The model is easy to install so that you can get it working in no time. The manufacturer included an easy to understand manual with diagrams you can use to follow the installation procedure. The pump is designed to deliver better energy efficiency. You will not have to worry that the model would end up taking up more energy, thus causing an increase in the energy bill. The needle wheel impeller is also great when it comes to making sure you get to enjoy using the skimmer for more time. In the end, you will end up with clearer and cleaner water. It might be a new model on the market, but it often delivers the right performance that people want. It is one of the smallest models you will get to see today. The small size does not mean it would not its job properly. This new model comes as a simple plug-and-play device. This should mean that the model is easy to get in position and operate. It will operate well for the nano aquarium up to a capacity of 37 gallons. Another thing that makes the model is the use of a partially closed system. The model is designed to work by the diffusion process. The results are that the model will remove no living plankton important for your aquarium. The model has the surface suction design important for removing the surface film. 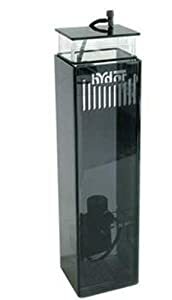 You will have an easy time filtering your aquarium water leaving it clean all the time. There is the use of an intermediate chamber that comes with a patented system, which prevents the case of over-foaming. The results are that you get bubble free outgoing water back to the aquarium. You still get a better airflow regulation and a silencer important for keeping the operation quiet. You will always love having a quiet skimmer in your room. There is the use of silicone buffers also important for preventing any transfer of vibrations from the skimmer to the aquarium. If you own a mini reef aquarium, it might not always be easy to get your hands on the best nano protein skimmer. Most of them would come in a large size that would make it impossible to use them effectively. It is the reason you have this model. The compact nature is important for making it a great skimmer for the mini-reef aquariums. The placement of the model inside the aquarium helps with providing a quiet operation. There is no doubt that most people would feel comfortable having a model that does keep them irritated with the noise. You get an impressive needle-wheel impeller important for increasing the air-to-water contact. This should help a lot with the operation of the skimmer. 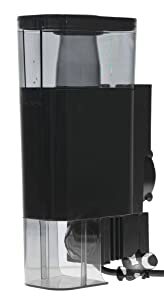 The manufacturer recommends that you get to measure the filter box area first so as to determine if the skimmer would easily fit before buying. There is the quick lock design important for cleaning. You can easily open it and start the cleaning without any problem. It still comes with the built-in grounded power cord so that you do not end up with electrical shocks. The presence of the suction cups should help a lot with the additional mounting of the aquariums. There are adjustable brackets great for making sure that you get to install the model correctly. This model comes in two sizes and we get to check out the larger model of up to 65-gallon capacity. It works also great for nano saltwater tanks up to 35 gallons in terms of capacity. When it could have been hard to get the best skimmers for the smaller tanks, this one should give you the performance you need. Based on a number of reviews, you could easily see that the product works great for your nano aquarium. The model is designed to have a small footprint. This means that you do not have to worry about the amount of space that it would take after installing it. Even if you have a small space, then you can always have an easy time squeezing it in position. The manufacturer also made it have an adjustable collection cup. This makes it great to adjust the model to work based on the demand. You still get the rubber o-ring in the cup important for keeping it tight to avoid issues of leaking. You also get a valve on the airline important for fine-tuning the performance of the skimmer. Most people would want to know about the installation process. Well, this model should take you about 10 minutes to unpack and get it in the tank. The instructions are also clear so that you have an easier time getting the job done quickly without any troubles. 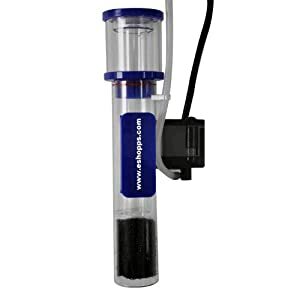 This is one of the best skimmers you could get today when it comes to the nano protein skimmers available. The model is designed to be robust so that you get to use it for years without worrying that it would not work the next minute. This is unlike the other models that you find on the market today. The use of an efficient pump is great for a protein skimmer. The Rock SP600 pump is great when it comes to making sure that you end up with the best performance skimmer. It is low power operation makes it generate less heat into the aquarium water. You always want to maintain the water temperature within a certain range all the time, even when passed through the skimmer. As part of reducing the noise levels, you get that this model comes with a silent air intake. There is the use of a noise-reducing muffler included in the air intake. This makes sure that you get to enjoy a silent time around your aquarium without having to worry about the noise from a protein skimmer. The size of the model also makes to have a small footprint. With the internally mounted pump, it should be able to save on the space for a sump. You also get a stylish design with this model. The use of the stylish colors should easily elevate the look of the sump compartment. It is still a reliable model that you can get on the market today. It will continue providing you with the best performance all the time so that you can enjoy the value for your money with it. There is the use of the intake guard that should help keep the fish from easily entering the pump. To be one of the best nano protein skimmers, you would be looking at a model that can deliver on performance, reliability, and many more features. For the list mentioned above, the Bubble magus QQ1 hang on nano protein skimmer should provide you with the best performance all the time. It still comes with the best pump that should provide the best bubbles important for cleaning the aquarium water. The stylish design should also get you interested in the model as it will make it look its best too. The first thing you have to do is check out the capacity of the protein skimmer. You have to make sure that it is marked correctly for your tank. Always make sure that the capacity is greater than what you have as the volume of the aquarium. Some protein skimmers would come with most parts assembled. You might have to assemble the remaining parts before setting it up in the tank. Check out the assembly process in the manual to do it right. Set up the skimmer based on the type of skimmer provided. Make sure to connect the hoses correctly to avoid any issues of leaking of the aquarium water. Double-check the connections making sure they are correct. Turn on the skimmer and watch it deliver the best operation. If you are stuck with assembling the skimmer, you can always check YouTube and see how other people connected a similar model. You will always feel comfortable when you end up with a model that can deliver performance and reliability each time when used. It is the reason you can always rely on the reviews to give you an insight about the best models of nano protein skimmers. Get the right model and you will no longer have to worry about the protein skimmers not working when needed anymore. The models we have reviewed are among the top models in the industry. You should have no problem with them at all.